Former Chicago Police Board President Lori Lightfoot rode to a landslide victory against Cook County Board President Toni Preckwinkle in the runoff race for mayor Tuesday, giving her a broad popular mandate to set a new blueprint for the next four years of housing and land use policy in Chicago. With about 97 percent citywide precincts reporting Tuesday, Lightfoot tallied 74 percent of the vote compared to just 26 percent for Preckwinkle. Lightfoot signaled during her victory speech that she would aim to spread the city’s wealth more widely than Rahm Emanuel, who oversaw a construction boom Downtown while most of the rest of the city bled population. “We can, and we will, give all of our neighborhoods the same time and attention that we give to Downtown,” she said. The first-time candidate also took an implicit shot at Alderman Ed Burke (14th), who was elected to a 13th term this year after being charged in an alleged extortion scheme to drive business to his private property tax firm. Lightfoot was widely expected to carry the race heading into the evening. The one-time private attorney and federal prosecutor came out in first place among 14 candidates during the first round of the election on Feb. 26, and her profile only has grown since then. She steamrolled Preckwinkle in fundraising and endorsements during the sprint to the runoff, thanks in part to $815,000 in contributions from construction trade groups and other real estate industry donors. Neither candidate had positioned herself as a real estate industry darling leading up to the February election. Both propose raising the real estate transfer tax on high-end properties, and both say they would increase affordable housing requirements for developers seeking zoning changes. Some business leaders dread saying goodbye to Mayor Rahm Emanuel, whose relentless courting of corporate relocations they credit for the city’s Downtown growth. And after businessman Bill Daley missed the runoff, real estate interests again scrambled to find a champion for their cause. But property owners have been guided by a critical difference in the candidates’ platforms: Preckwinkle pledged her support for a bill that would overturn the state’s ban on rent control, while Lightfoot opposes the measure. Few political issues have done more to captivate developers and landlords, who are fighting to keep a lid on rent control at all costs. Lightfoot scored donations from firms including JMB Realty, Prairie Management Group, Brinshore Development and Fifield Realty. LiUNA Chicago Laborers’ District Council PAC, previously a supporter of failed mayoral candidate and current state Comptroller Susana Mendoza, donated $500,000 to Lightfoot. Preckwinkle, meanwhile, received contributions from principals of The Habitat Company, Magellan Development Group and the Holsten Real Estate Development Corporation. The powerful political arm of the Chicago Association of Realtors held off picking a favorite, citing broad respect for both candidates. 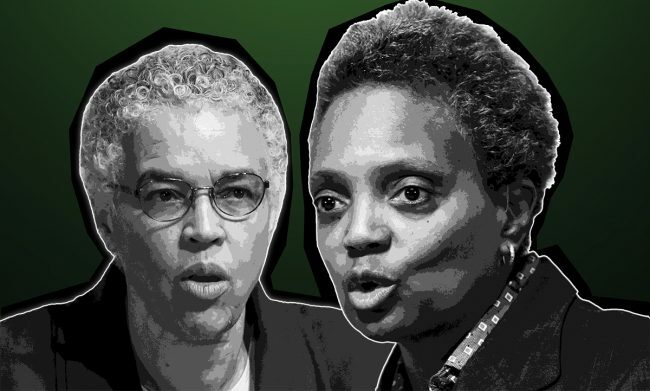 During a January forum hosted by the Realtors group, both Preckwinkle and Lightfoot said they would work to expedite the building permitting process and widen the city’s list of acceptable construction materials. But unlike former candidates Bill Daley, Gery Chico and Paul Vallas, neither woman supported a moratorium on property tax increases.